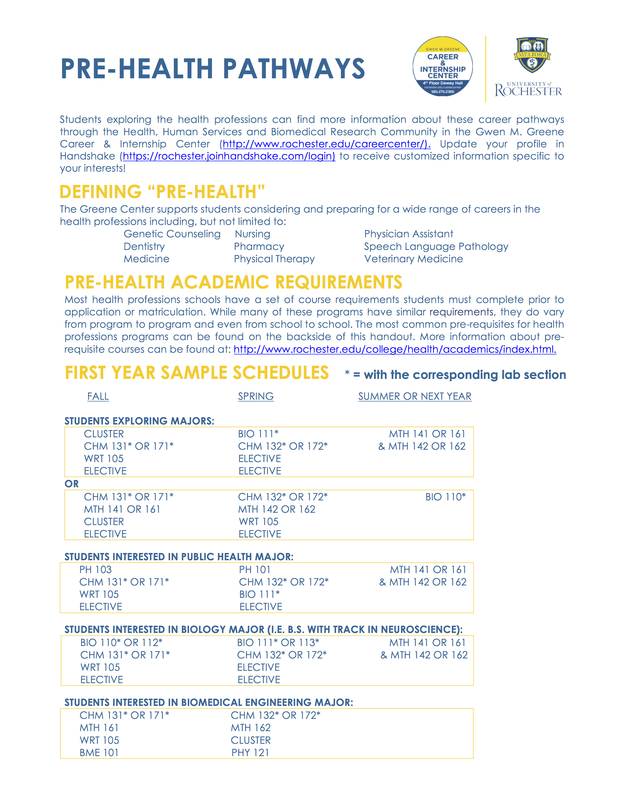 The following documents provide a sampling of course schedules pre-health professions students may consider, taking into account pre-requisite courses, potential majors and application timelines. Also included are a list of pros and cons to consider when making academic choices. PLEASE REMEMBER, these are only samples; they are not a formula to ensure that if you take these courses in this order then you will receive an acceptance to your chosen health professions graduate program. Every student will complete their pre-requisites in a variety of ways, and the following schedules are only some ways students might consider. It is best to meet with a career adviser to discuss the option that best suits you as an individual student. Most single majors require approximately 12 courses, sometimes including pre-requisites; it is possible that your schedule will look a bit different than those given based on overlap allowances, for instance. We strongly discourage first semester freshmen from taking more than 2 science courses; the transition to university can be more challenging than expected and, for many students, limiting their schedule to two science courses can help maintain their science grade point average. Although we don’t normally recommend taking health pre-requisite courses over the summer without a compelling reason, students may consider taking the calculus sequence in the summer (freshman or sophomore year). This will allow them to take a wider range of courses in their first year and, ultimately, help them decide their major focus. It has the added benefit of smoothing their transition to university life. Below are samples of first year course selections for students interested in pre-health pathways. Please speak with a career adviser to plan out your courses.